If you are traveling with a crowd or best relax when surrounded by the comforts of home, then Alabama Gulf Coast beach houses have got you covered. 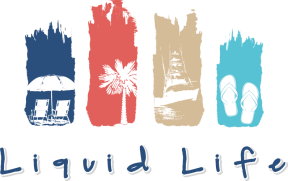 Choose an Orange Beach or Gulf Shores vacation rental right on the sand or in a community with public beach access nearby. Your beach house will grant you space and amenities to maximize your time away. Here’s a brag on the benefits a Gulf Shores or Orange Beach rental home can bring to your next vacation. Visiting the area this weekend or next? Check for Vacancies. Choose from the best variety of vacation options, with 200+ beach houses and 1,000+ coastal condominiums in all price ranges. We provide reservation and check-in service 24 hours every day. Sunset Properties offers over 100 picturesque beach homes and condos from Gulf-front or Gulf-view to private boat slips on Mobile Bay. We have pet-friendly rentals, too. Get ready for a sweet Southern experience with Southern Rentals and Real Estate when you stay in our one to seven bedroom Gulf-front and beach-access condos and homes in Orange Beach and Gulf Shores. Why Choose a Beach House? At a Gulf Shores or Orange Beach house, you’ll find space to unpack in the bedroom closets, to bring food for the kitchen and to leave your sandy shoes and beach gear on the porch after a day of frolicking in the surf. Play a board game on the dining room table after dinner or sip your coffee on the porch while you watch dolphins surface in the early morning waves. Depending on the number of bedrooms you choose, you can bring the whole family, multiple families or your whole group of friends. Location - Make sure you’re choosing a property that is close to the attractions you’ll be exploring. 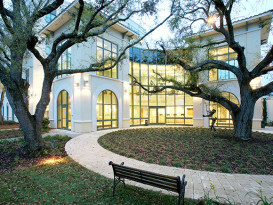 Gulf Access - Choose the view you desire, whether this be one of our Gulf front, side, or waterfront properties. Pet Friendly Properties - Bringing your furry friend along for the trip? Make sure you choose something pet-friendly before pulling the trigger! Party Size - How many people are you traveling with? Ensure your property selection can accompany you and your party. Parking - Determine whether or not you’ll need to figure out parking, or if your selected property covers it. Amenities - Before settling on your beach house rental, research the different amenities that will be included that fit the needs of you and the rest of your party. Pets are often welcome at many beachfront rentals. More than 40 beach houses in the Gulf Shores & Orange Beach area are considered pet-friendly rentals. In some areas of Fort Morgan, pets are also permitted on the beach. In a beach vacation rental, you may find multiple televisions, a stereo system, a washer/dryer, a grill, board games, DVDs, extra blankets and towels. In the kitchen, you will find many appliances you need for meal prep—from blenders to frying pans, cutting boards, and toasters. With so many conveniences on site, you’ll find there’s not much to pack besides your swimsuits and attire. Whether you need a simple two-bedroom home near public beach access, a 5,100 square-foot Gulf Front villa with a balcony, or something in between, Gulf Shores and Orange Beach rental homes come in many different locations and sizes. Some have shared pools, sprawling boardwalks over the beautiful dunes, grassy yards a few blocks from the shore, and porches just steps away from the Gulf spray. You can be picky about your décor as well—so you can rent the beach home that best fits your timeline and tastes. Beach houses on the Gulf Coast are a great location for corporate retreats, beach weddings, church retreats, or family reunions. One duplex in the area—a 5,100 square-foot space with a Gulf Front view—includes eight king bedrooms, two triple bunk rooms, an elevator, a gourmet kitchen, a wet bar, three dishwashers, a sundeck and a porch. Vacationing in a beach home is notably peaceful, as you are engulfed in a relaxing atmosphere where you can sleep in or watch the sunset just as easily. While you may have a single shared wall if you are in a duplex, most of the noise will be muffled inside your own rental. Depending on the total square feet you choose, you may find that your beach home has more than one master suite, multiple living areas, multiple balconies, multiple washer and dryers, and more parking spaces than other accommodation options: making your beach getaway peaceful and easy. Many beach homes have a private or community pool. Others have picnic tables, porch swings, fish cleaning stations, private docks, or a pier where you can keep your canoe, kayak, or boat right on Mobile Bay or Little Lagoon. If you’re in a community of beach homes, you may find many family-friendly amenities such as a tennis court, shuffleboard, putting green, or local fitness center. Not to mention, many beach houses are in prime locations, close to attractions and activities such as the best golfing or fishing location. Ready to book your beach vacation? Find the best beach house for your vacation today. 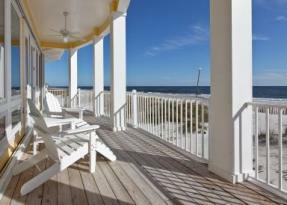 Also feel free to browse our wide selection of condos or hotels in Gulf Shores and Orange Beach.